Recently we have seen many smartphone releases. But majority of companies started focusing on mid and low budget smartphone. Recent low budget smartphone launched by Lenovo and MI. There was a time we used to get Android smartphone with HD and Full HD screen in only high end phones but now scenario has been reversed. Here we are going to compare latest release by Xiaomi and Lenovo. 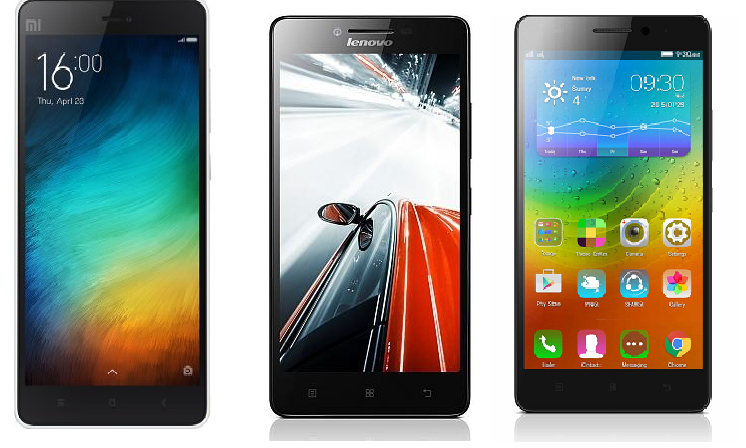 So its Lenovo a7000 vs Xiaomi MI 4i vs Lenovo A6000 Plus. Xiaomi MI 4i has 5 inches IPS LCD capacitive touchscreen with resolution of 1080 X 1920pixels (441 ppi pixel density). While on the other hand both Lenovo A6000 plus and Lenovo A7000 comes with HD display while Xiaomi MI 4i have Full HD display. Lenovo A6000 plus have 5 inches IPS capacitive touchscreen having resolution of 720 X 1280 pixels (294 ppi pixel density). Lenovo A7000 has 5.5 inches IPS capacitive touchscreen having resolution of 720 x 1280 pixels (267 ppi pixel density). Here if you want more clear picture in small screen then MI 4i will be your choice where as if you want same screen with decent picture Lenovo is best choice for you. Xiaomi MI 4i has 2 variants when it comes to processer. One variant have 1.7GHz Quad-core processor and other variant have 1.0GHz Quad-core processor with Qualcomm MSM8939 Snapdragon 615 chipset. It also has Adreno 405 graphical chipset. Lenovo A6000 plus also have Qualcomm MSM8916 Snapdragon 410 processor with clocking speed of 1.2GHz. Also Lenovo A6000 plus have basic Adreno 306GPU.Lenovo A7000 have Mediatek processor. It have Mediatek MT6752m Octa-Core processor clocking at 1.5GHz. These devices have Mali-T760MP2 GPU. All three devices are almost the same processing power. But differ on their GPU side. Both Mediatek and Qualcomm provide almost good graphical experience. But on part of Mediatek based processor OS updates are major concern. All 3 devices have 2GB RAM memory which provide user good experience with multitasking. Xiaomi MI 4i and Lenovo A7000 have Android Lollipop version 5.0. On the other hand Lenovo A600plus is having Android KitKat version. Xiaomi MI 4i and Lenovo A6000 plus have 16 GB internal memory. Lenovo A7000 expected to be launched with 8GB internal memory. When we talk about expandable memory card slot Xiaomi follow little conservative approach to provide expandable memory. Both Lenovo provide micro SD, up to 32 GB. Camera has become very crucial aspect in smartphone. We all know selfie craze growing among this young generation. Xiaomi MI 4i: . Xiaomi MI 4i have 13MP rear camera with autofocus, dual-LED (dual tone) flash. It also offer feature like Geo-tagging, touch focus, face/smile detection, panorama, HDR. It also has 5MP front camera shooter which provides video recording 1080p@30fps. Lenovo A6000 Plus: Lenovo 6000Plus have 8MP rear camera with autofocus LED flash. With features like Geo-tagging, touch focus, face detection. It have 2MP front camera. Lenovo A7000: Lenovo A7000 have 8MP rear camera with autofocus LED flash. With features like Geo-tagging, touch focus, face detection. It have 5MP front shooter camera. So if you are camera enthusiastic then choice is almost clear for you to select. Xiaomi MI4i have removable Li-Ion 3120 mAh battery and Lenovo A6000 Plus have removable Li-Po 2300 mAh battery. On the other hand Lenovo A7000 have Li-Po 2900 mAh battery. All three deices are having best config for their price range. But if you are keeping price aside then Lenovo need to improve on their config side. Lenovo do not provide 8MP + camera in budget phone while looking to market today camera has become inseparable part of smartphone. All three deice provide decent battery backup. So All I can say is Xiaomi MI4i seems impressive. Still I will like to say they are best in their price range. I hope this have provided you clear insight of all aspects. You want to know. If you have any question or query comment below. Thanks for reading.